The new 60,000-bph, fully automated CompuWeigh bulk weigh loadout scale at The Andersons’ grain elevator in Reading, MI, installed the second week of July 2013 designed to load 75-car trains on the Indiana Northern short-line. Photos by Ed Zdrojewski. Back when Jake Drake started as operations supervisor at The Andersons Inc.’s 2.5-million-bushel grain elevator in Reading, MI (517-283-2156) in 2009, a unit train consisted or 50 covered hopper cars, and they were loaded a few at a time out of an old 20,000-bph bulkweigher. Today, a unit train has 75 railcars, and the railroad allows less than a 12-hour loading time, before applying demurrage charges on top of the regular per-car freight rate. The Reading elevator loads trains on the Indiana Northern Railroad, short-line with connections to the Norfolk Southern at Montpelier, OH, a few miles to the south. The elevator lacked the capacity to keep up. In July 2013, The Andersons remedied the situation by replacing the old loadout scale with a brand new CompuWeigh 60,000-bph bulk weigh loadout scale, equipped with a complete package of GMS control software. Drake notes that CompuWeigh Corp., Woodbury, CT (203-262-9400), is a preferred supplier to The Andersons, so the grain handler had a certain amount of experience with the supplier at other locations. 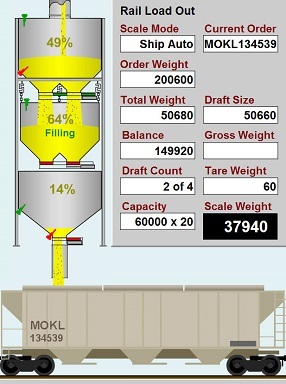 Also, he adds, the CompuWeigh product was easy to integrate with the facility’s grain accounting software, the supplier offered plenty of support, and the price was competitive. SmartRead, which includes a trackside RF tag reader that “reads” the ID mounted on North American railcars. The system accesses CompuWeigh’s SmartCar database, which includes dimensions and capacities of all the railcars in service in North America. Wheel sensors can alert the system to any cars missing RF tags, so no car is ever unaccounted for. SmartLoad, which preloads the weigh hopper allowing the bulkweigher to continue filling, while thenext railcar is brought into position. As of mid-October, Drake says, the new scale had been used to load only a few cars at a time. However, he anticipates that it will cut 2-1/2 hours off the loading time of a full 75-car train.